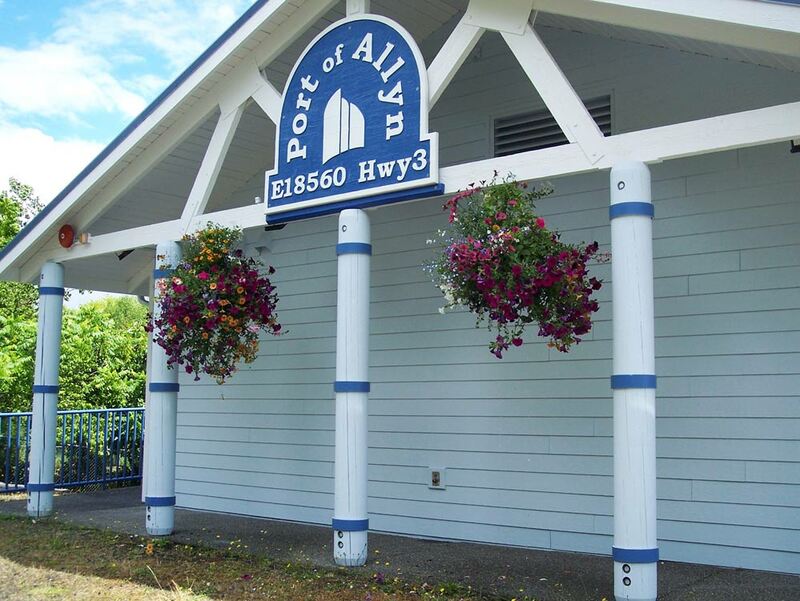 The Port of Allyn is the oldest port district in Mason County. It was formed in August 1921 at a cost of $7,500 to promote industry and commerce, and provide a commercial dock for both Allyn and Belfair. The original district boundaries included most of Allyn and Belfair. At the time, the residents of Victor a community east of Allyn on North Bay, petitioned not to be included because they expected to form their own port district. In 1973, after 52 years, the Victor area voted to annex to the Port of Allyn. In April 1922 the newly formed Port of Allyn bonded itself for $10,000. An Army Corps of Engineers permit to construct a wharf was obtained in July 1922. The wharf was completed and in use by November of the same year. The first Allyn public dock was a 580-foot trestle extending out from Drum Street, in the same location as today’s Allyn Dock. A 61-ft x 73-ft wharf was built at the end of the trestle. The north end of the wharf was a covered warehouse used for many years to store lumber, hay, grain, and other trade goods for local businesses. The south end was a covered storage shed, which eventually was converted to an oyster opening and processing plant. In addition the new dock had a 10-foot by 50-foot float to the north of the warehouse. In the 1920’s and 1930s logging and farming were the principal occupations of Allyn and Belfair residents. For many years steamers made regularly scheduled trips from Allyn to Tacoma, Steilacoom, and Shelton, to transport mail, passengers, and freight. As roads improved and auto, bus, and truck transport became popular, stores moved closer to the highways and commercial water traffic declined. During the 1940s civilian war workers employed in Bremerton at Puget Sound Navy Yard occupied all available housing within driving distance of work. Many who settled at Allyn and Belfair remained here after the war. In 1921 records show the Port District had 113 registered voters. In 1938 there were 515 and in 1946 Allyn and Belfair precinct lists showed 2,061. In 1976 there were 2660 registered voters and during the most recent election 6086 were registered. The oyster industry grew substantially during the 1940s due to the rationing of meat and increased consumption of fish and shellfish as meat substitutes. It was observed then and it is still true today that the North Bay of Case Inlet is very productive for shellfish. The Allyn Dock and covered shed were leased to a succession of oyster companies for a period of 30 years. The warehouse, oyster house, and pier at Allyn deteriorated and were removed by burning in 1949. The remaining 380 feet of trestle connecting to shore was retained and continued to be used seasonally for 1oading and unloading oysters until 1974. As Belfair’s population grew there was public pressure for the Port to provide public access on Hood Canal. Until 1940 the only public access to the Canal near Belfair was at Twanoh State Park on South Shore (SR106) 10 miles from the Belfair shopping center. In 1940 Tract 1 of Pleasant Beach Cove tracts was purchased to provide access to Hood Canal about 5 miles from Belfair on the North Shore. The first Belfair public dock (North Shore), located where the present dock is located, was begun about 1948 and completed in 1952. It was a floating dock with cedar log floats chained together and pilings kept the floats in place. In the 1950s it was used seasonally for loading and unloading oysters. However, its principal use was for water access for recreational fishing and swimming. In 1957, to serve boat owners in the Allyn area, a launch ramp was constructed adjacent to the Allyn dock. The same year Lots 19, 20, and 21 of Pleasant Cove Beach Tracts on the North Shore of Hood Canal were acquired and the dock at this site was completed in 1958. The first North Shore dock deteriorated and by 1970 residents were demanding it either be completely rebuilt or torn down for safety reasons. The Port commissioners made the decision to rebuild and improve all port properties to help meet the recreational needs of the area’s increased population. The Belfair (North Shore) dock was completely rebuilt in 1971. It is a 65-foot long trestle with a 100-foot float and two finger piers, which provide moorage for 10 boats. It is used to capacity in the summer months by boaters and fishermen and through the winter for wet moorage. In 1974 the Allyn Dock was extended out 190 feet, restoring it to its original 500-foot length. The Allyn dock has always been a popular fishing spot. On summer evenings as many as 80 or 90 people at one time of all ages, have been observed fishing off the dock or strolling, swimming, visiting friends, and enjoying the scenery. Five acres on North Shore including 280 feet of waterfront were purchased in 1992 and a 200-foot floating dock and ground level launch ramp were installed. 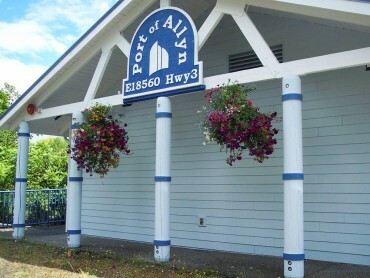 The Port, in cooperation with the Allyn Community Association, built the Allyn Waterfront Park in the late 1980s. A 60 foot diameter gazebo was built by the Allyn community in 1989 and donated to the Port. In 1983 an elevated boat launch was added to the Allyn site and in 1993, a sea wall was constructed to stop erosion of the parking area. The Port building, which houses the administrative office and Commissioner’s meeting room was completed at the Allyn site in 1995. The lower level of the building was left unfinished due to lack of funds. In 1999 this area was completed and is being used as the Commission Meeting room and the upper level has been divided into office space. 1998: Port worked with Lions Club & Mason Transit to construct bus shelter on Port property near Port Administration building. 2000: The Allyn pier was renovated, the south pier extension and main float were replaced, a longer gangway was installed and a marine pump-out unit was provided and new lighting was added. 2001: In September of 2001 the Port purchased 150 ft of waterfront in Allyn to be developed as a kayak park. 2002: Port purchased additional 150 of shoreline property adjacent to the Kayak property to provide beach access. With help from the Allyn Community Association a half-court basketball area at the Waterfront Park in Allyn was completed. The North Shore Dock underwent a complete renovation in fall of 2002. This included replacement of the pier, floats,replacing the 30 foot gangway with an 80 ft gangway, and adding a marine pumpout unit and lighting. A new well and pump house were also added. 2004: Development of the kayak park including pathway to the beach, picnic tables, restroom, landscaping, parking area and educational signage. 2005: Replacement of the ground level launch ramp south of the dock, addition of a boarding float, and acquisition of 160 ft of shoreline property to be developed for public use and expand launch area to provide better access for boaters. Port Started Phase 1 of an upgrade & expansion of the existing water system. In Fall of 05 the pump was replaced & upgraded. 2006: Phase 1 completed, all piping for the existing system replaced and expanded & placed 2 new hydrants on east side of SR3. Phase 2 of the water system project — purchase of property at the corner of Wade St. and Fife. 2007: Permanent Restrooms at Waterfront Park. Complete construction of 144,000 gallon holding tank for water system corner of Fife & Wade St. Installation of 8 inch main line from water tank to well, 4 additional hydrants west of SR3. Design & Installation of sand filter in well. 2010: Received Water Rights for 300 acre feet of water, approximately 1,000 hookups, which should meet the needs of the UGA for 20 years.